Slippery and slurpy, the nine tracks on this CD show that trombonist Joe Fielder has the chops to carry off a session backed by only bass and drums. The Crab is so memorable because it’s also no show-off’s technical exercise. The New York-based bone man invests each one of his bustling original compositions with emotion, humor and excitement. A veteran of Latin as well as straight jazz bands, Fielder even brings Hispanic tinges to lines such as the title track and “A Frankfurter in Caracas”, which also pays homage to his mentor, German trombonist Albert Mangelsdorff. At the same time, like the older brass man, his solos on these and the other tunes while lyrical, encompass bitten-off notes, double tonguing, low-pitched growls and snorts. 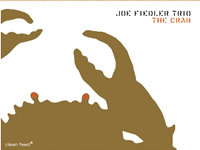 Using a collection of mutes and multiphonics his solo on “The Crab” is particularly outstanding, since he doubles entire passages with both mouthpiece and his own mouth, while elsewhere articulating staccato runs as effortlessly as J J. Johnson. Not to be outdone, bassist John Hebert and drummer Michael Sarin sympathetically stride alongside. Tower of strength, the bassist, who on “New Rugs” gets an opportunity to scurrying up and down his strings, elsewhere exhibits weightlifter strength walking, slapping and reverberating. Sarin, who has backed other individualistic improvisers like bassist Mark Helias, is so subtle in his flowing accompaniment that he frequency beats time on drum tops with his palms or provides rhythm with just drum sticks. Whether chromatically tonguing notes as if playing a valve instrument or sounding as if reverberating tones appear are being be squeezing through a grater, the trombonist is always in control. Concluding the recital diminuendo, backed by drum pitter patter and bass thumps, he cycles through guttural slurs and ripples from an a capella intro that combines “Reveille” and rubato pumping.